Do you have dreams of starting a business but you’re too broke to get it off the ground? Building a company is expensive. You could try to save up, but that might take years. They say you have to spend money to make money. But, more than likely, you’ll have to spend someone else’s money by getting a business loan. However, deciding you need a “business loan” is an oversimplification. When it comes to business funding, there are actually a lot of options to choose from. Discover the 8 most popular types of business loans to help your business now. A merchant cash advance will give you one lump sum up front. This is helpful if you need capital right away. The drawback here is you have to make frequent payments towards the loan. With a monthly payment, you have all that time to pull together the money. But with a merchant cash advance, you have to make daily or weekly payments. Another issue is the interest rates. These can run very high, so you have even more pressure to pay it back as fast as you can. This can put a lot of strain on a new business. Term loans are very common and will also present you with a lump sum upfront. From there, you’ll pay the loan back in predetermined monthly installments. You can get one of these loans from a bank or online. This company is an example of a great online lending company. The benefit of getting your loan online is that you’ll get the money a lot faster. Usually between a few days or a week. Banks will take longer, but the interest rate is generally lower. With a term loan, you’ll likely have to put up some kind of collateral. That can be a house you own, expensive equipment for the business, etc. Do you already have your business up and running but need a bump of cash? Then a working capital loan might be right for you. These loans are generally smaller sums of money. That money might be used to expand the business or pay employees after a lackluster earning quarter. For this loan, you need to have really great credit. If you don’t, you’ll probably have to look elsewhere. Another thing to keep in mind is how long it will take to get this money. It could take months, so if you need it right away, it won’t do you much good. A business line-of-credit loan is the same concept as a personal credit card. You get a credit limit, and you can withdraw money up to that amount. One benefit of this loan is that you only have to pay interest on the money you’ve spent. Though you do need good credit to get the loan, you generally don’t have to put up any collateral. Line-of-credit loans generally work best for business owners who are already up and running. The loan is best for taking care of unexpected costs that arise. This type of loan is relevant for small businesses that are already up and running. Invoice factoring loans lend you money based off unpaid invoices that people owe you. For example, say you have a small graphic design business. You delivered marketing materials to a client and invoiced them for the work. But suddenly, they aren’t returning your emails. The money they owed you was supposed to go towards paying the utility bill for your office. That’s where invoice factoring comes in. A lender pays you for the outstanding invoice. Then the company goes after the other party to pay them directly. These are great loans if you can get them. The borrowing amount is very high, up to five million dollars. The interest rates are low, and you get a comfortable amount of time to pay them off. However, these loans are hard to qualify for. Additionally, if you need the money fast, you definitely should look elsewhere. 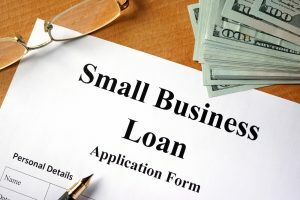 An SBA loan requires a long application process. But, if you haven’t started your business yet and you’re okay with waiting to get it on its feet, this is a good option. Equipment loans help you pay for, you guessed it, equipment! The equipment itself works as collateral, so you can build equity in it. Plus, if you have good credit, you can get a pretty good rate on it. However, if you’re in an industry where the equipment is constantly evolving, this might not be a great option. You could still be working on paying off the equipment after its already become obsolete. But, you own the equipment, so you have to finish paying it off anyway. Of all these types of loans, this one is likely to carry the lowest interest rate, if your rich aunt charges you any at all. However, getting a loan from a loved one carries its own very unique risks. Ones that aren’t necessarily financial, but personal. That’s why you must treat the loan as professionally as possible. If you don’t, miscommunications could ruin your relationship. You don’t want Auntie complaining about you behind your back to your other relatives. Get the terms of the loan in writing. This includes the time table of paying them back, interest rate, and the stake they’ll have in the company. If things do go sideways, you at least have a written agreement to back you up. If you have dreams of being your own boss, you can make it a reality. These 8 types of business loans can help your company get on its feet. Did you enjoy this article and what to check out others like it? Then read this article to learn more about how to start a successful business.